This is my fourth year as a teacher and I have noticed a dramatic improvement in my teaching every year since I started. This is the year I finally have the time and wherewithal in the classroom to be effective at my job. I feel like I have a grasp on my content, I can design engaging activities, and I can anticipate student misunderstandings–all of which make for more effective lessons. I finally feel empowered in my classroom. Yet as happy as I am for how far I’ve come in my teaching, I am beginning to feel discontent with my work and I realized it’s because I feel isolated in my classroom. But this is simply how the profession is designed: teachers work in a classroom with the door shut all year. Year after year. For their entire career. Occasionally the staff all come together for a meeting or protocol “development”, but these are viewed as unwelcome interruptions to the coveted coverage of the curriculum. As I begin to ponder how this plays out for my career, I’m having serious doubts that I can sustain such work. And I’m not the first teacher to feel this way. The problems with the teaching profession are all over the news. Teachers talk daily of their past colleagues who have left the profession, either to change careers or to “move up the ladder” into administration and central office work. Teachers lose respect for the leaders who removed themselves from the students and I understand this sentiment. In my fourth year I’m starting to see the flaws in the design of the school system. More importantly, I now see the inherent flaws to the teaching profession itself. Teachers needs more opportunities to feel successful and recognized for their work without having to leave the classroom. In particular, teachers crave opportunities for growth, influence and reward in their job. I’ve been reading the book Teacherpreneurs with a few passionate colleagues and it’s brought on some interesting conversations. 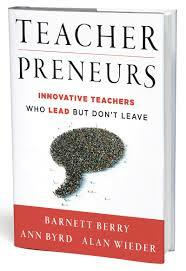 The book proposes a redesigned role in schools: teacher leaders. This idea, spawned by the Center for Teaching Quality, is already becoming a reality in some individual school districts across America. However, I read an article recently by a teacher in Kentucky who is fulfilling one of these new hybrid roles as a teacher leader and spreading it across the entire state. In fact, Kentucky has started an entire initiative to transform the teaching profession. In the article, the author reflected on how much she enjoys being able to advocate for the teaching profession while still continuing to do the work. She comments on the lunacy of having a set of school professional roles–coaches, mentors, administrators etc.–all removed from the act of teaching. How can anyone possibly lead, evaluate, and develop teachers when they themselves aren’t teaching? So, do teachers receive a lot of hype for complaining about their jobs? Yes, we do. But for good reason. Teaching requires a lot of skill and expertise. It’s a challenging and creative job, which is what I love about it. But the environment in which teachers work often stifles the passion we have for our jobs. If we want to talk about the problems in education, the teaching profession is by far the biggest issue that has the most potential to change educational outcomes for all. Teachers are the experts of learning and that should be reflected in how schools operate. So, I urge Missouri–and other states–to follow Kentucky’s example by redesigning the traditional structure of the school system. We need to create schools in which teachers can be leaders and experts in solving the community’s educational dilemmas. There need to be more opportunities for teachers to utilize their strengths and “move up” (so to speak) without having to leave the classroom. Otherwise, we’re doing students a paramount disservice every time a great teacher feels discontent and decides to change careers.